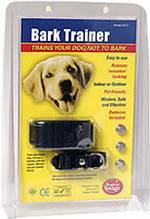 An effective training aid to reduce unwanted barking. Worn on a collar around the dog's neck. Emits ultrasound noise, which the dog does not like, when the special sensor detects barking. 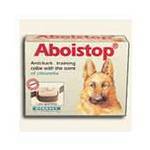 Quickly trains the dog to improve behaviour. Safe, pet friendly, and less expensive than professional training. Batteries included. The moment your dog barks, a spray of citronella, painless and harmless, is released and surprises it. The effect of surprise is sufficient to interrupt the dog in its undesirable behaviour. In a few days, the dog learns to keep quiet while wearing the collar and concentrate on more normal activities. No more trouble with the neighbours ! No traumatising sensation, no side effects on the dog or his sense of smell, as soon as you want to allow your dog to express himself as before (to guard the house, when you're staying in the country, etc) all you have to do is remove his collar.